Greek 1: Introduction to Ancient Greek (2008 Autumn UCSC). Greek 2: The Saga Continues in Ancient Greek (2009 Winter UCSC). 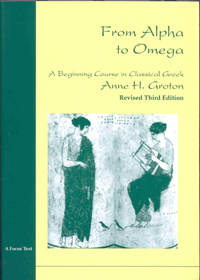 Greek 3: At last we are Reading Ancient Greek (2009 Spring UCSC). Pilgrims and Pilgrimage in Ancient Greece. Other books on Ancient Greek and Greece (for NaNoWriMo 2007 project). Started (Day 1) on Boxing Day, 26 December 2007. Chapter. Words assigned to learn. Total words assigned to learn so far. 3. Ω-verbs: Present Active Indicative, Present Active Infinitive, and Present Active Imperative. Assigned first 10 words. 10.